Here it is ! The cream of the crop of cookstoves, the Gold Medal Glenwood. Wood firebox and oven below,upper gas oven and broiler up top. 4 gas burners on rt. fill this beauty out. Pale yellow enamel, easy to clean and brightens up the kitchen. A year round stove that will keep you warm in Winter and cook with gas all Summer. Great gas broiler ! 28 inches wide and 28 deep. 3 feet high to the cook surface. Very popular size; will fit into most conventional kitchens. 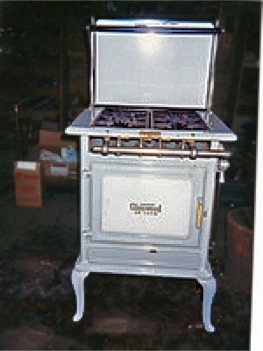 Has a nice large oven and 4 beautiful cast iron burners.